It was an eventful year. One filled with so many emotions, aided by so many people and providing so many fantastic moments. I have decided to re-live these moments through images that summarize my 2014 year. 2014 was the year I joined Uplace-BMC Pro Triathlon Team. It was to be a new adventure, a different support setup, one which I am very thankful for. 2015 will be more of the same. January 2014 – Camp 1 of the Uplace-BMC Pro Triathlon Team. The first time athletes, management and sponsors would be together, creating the foundation for what would be a successful 2014. Uplace-BMC Pro Triathlon Team is an incredibly impressive setup including a large number of backroom personnel. Bob De Wolf pictured above acts as Team Manager whilst his brother Ben De Wolf acts as Sports Director, both have been instrumental in the success of Uplace-BMC in 2014. Winning matters to me, it justifies why I sacrifice so much to be successful in this sport. 2014 provided myself and the team around me with some memorable victories. San Juan 2013 was my first ever non-draft race, it resulted in a surprise victory. Returning in 2014 to take the win was special. I love San Juan! Moving to Boulder was tough on my system, I got sick, had to take more rest than I wanted to and it sucked. Regaining fitness and having my parents travel over from Denmark was a nice return back to racing in early summer 2014. Korupt Vision caught the raw emotion of crossing the ‘Hy-Vee’ finish line in 1st place. It was to be the first of two $100.000 pay-days for me in 2014. 13 Days post IRONMAN 70.3 World Championship withdrawal and disappointment I headed to the island of Lanzarote to ‘unleash some evil’. Winning matters for more reasons than the obvious. 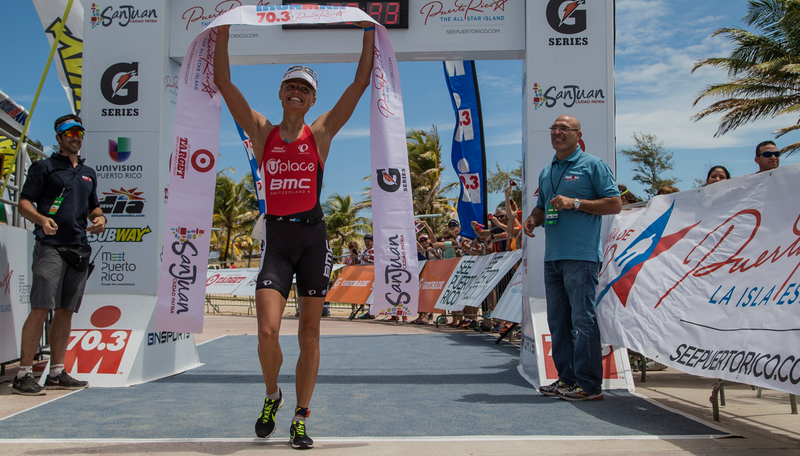 It was one of the highlight races on the global triathlon racing calendar. It was hyped up as one of the biggest races of the year. The start list reflected it, the coverage showed it and the organization delivered on their promise of it. To win this race is hard to describe, hopefully pictures prove better than words. That race. The perfect end to a fantastic year, the victory of Challenge Bahrain. I’ll relive that moment and that race for a long time to come. Alicia Kaye has become a close training partner, a close friend and one of my hardest competitors. What makes our relationship special is that we thrive and develop off of the success and accomplishments of the other. Nils Nilsen (LAVA Magazine) captured this amazing image of Alicia and myself prior to the start of St. Anthony’s triathlon. Another symbolic showing of our respect and appreciation for one another. It is no secret that I am fond of this sport. Mentoring, guiding and acting as ‘coach’ to an aspiring group of amateurs is what keeps my mind ‘sane’. In 2014 I gained a massive amount of satisfaction from being a part of the success of small group of athletes. Maja Stage Nielsen finishing 3rd behind my 2nd place finish at the ETU European Middle Distance Championships was a special moment in 2014. A man that is the absolute backbone and rock for everything I accomplish in this sport, Ben. 2014 was the year Ben and I got engaged. Ben’s commitment and sacrifice to support my career is immense. Ben carries a substantial level of understanding for the sport and what contributes to high performance success. My results are a reflection of his commitment and work behind the scenes. Joel’s influence on my career has been immeasurable. Our relationship continues to evolve since teaming up in late 2011. The results of 2014 have been 3 years in the making. Joel teaches you the absolute necessities of high performance success: hard work, dedication and consistency. Joel and I often operate on a long distance coaching relationship. In the lead up to Bahrain, Joel along with his wife Kerry and daughter Charlotte made the commitment to spend 3 weeks with me on Sands Beach Resort. It would be the first time Joel and I had been together since March 2013. Joel’s success and proven work with triathlon superstars brings ease, reassurance and confidence to us all. Outside successes demonstrate we are in safe hands. In 2014 Joel claimed two silver medals at ITU World Triathlon Championships with Mario Mola and Sarah Groff in addition to Alicia Kaye’s reclaiming of the Life Time Tri Series. Claudio is my ‘hidden gem’ he has been at the top of my treatment team since 2007. In 2014 we made an even bigger commitment to having Claudio around me more often and in crucial periods. Claudio is one of the most specific and competent Osteopath practitioners I have worked with. He continuously ensures my body is in-line and structurally sound to cope with the demands of training and racing. A man who has developed a team around him that carries passion and enthusiasm in everything they do. JC has played a big role in my 2014 success.